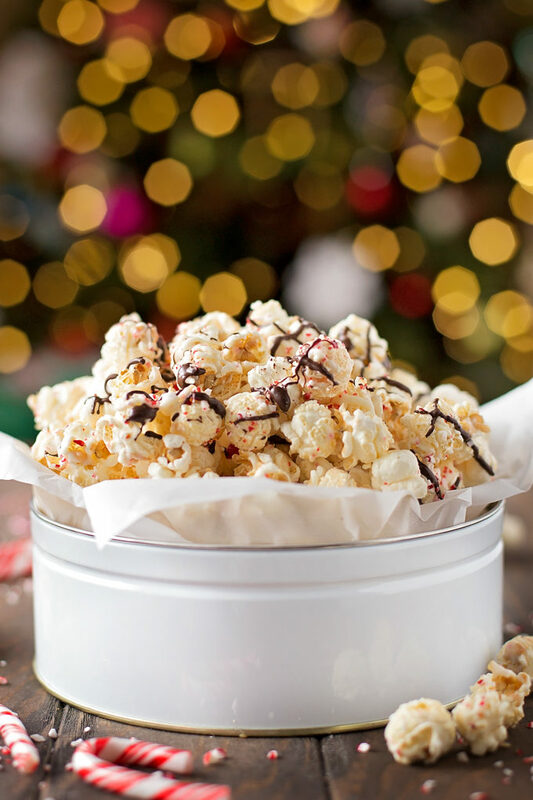 This white chocolate peppermint popcorn is a quick and easy holiday treat. It’s coated in white chocolate, crushed candy canes, and drizzled with dark chocolate. Remember how last week I wrote about my popcorn predicament? I’ve only used up 1/3 of one bag! We may be eating popcorn for breakfast, lunch and dinner from here on out! If you have any delicious ideas PLEASE send them my way!! 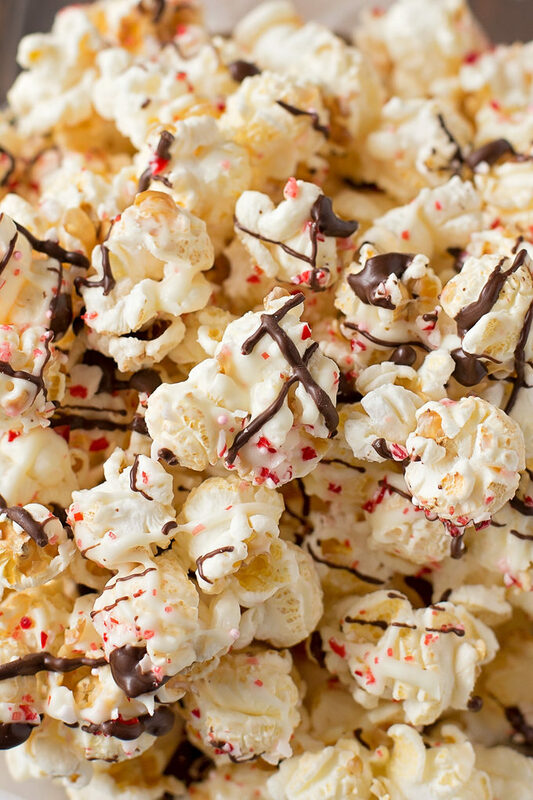 Today’s recipe is my version of Angie’s White Chocolate Peppermint Popcorn that I became obsessed with last year. It’s sweet and buttery with a hint of sea salt. Oh, and it’s coated in crushed candy cane and drizzled with dark chocolate. Sounds amazing, right?! You’ll start with 1/2 cup of mushroom or jumbo popcorn kernels. Pop them using an air popper or over the stovetop. You don’t need any butter or salt to begin with (we’ll add a little bit of sea salt as a finishing touch). 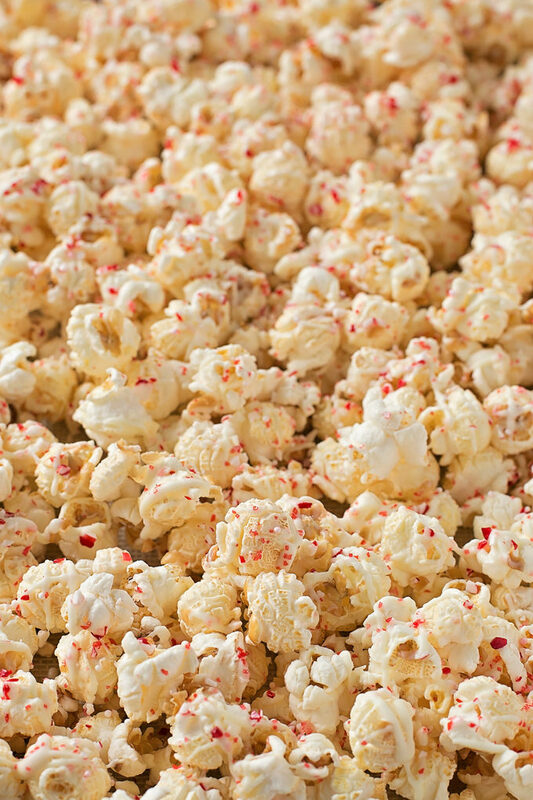 Set aside the popcorn and melt the the white chocolate. For this recipe and most of the “candy” recipes I make, I like to use high quality chocolate melting wafers (peels or snaps) like Ghirardelli, Callebaut, Merckens, or Guittard. They have a nice sheen to them and they don’t melt in your fingers as much as a chopped block of chocolate would. I combined a half cup of white chocolate melts with a half cup of peppermint baking chunks (Ghirardelli sells them during the holidays at places like Target and Walmart). Of course, if you can’t find them you can use 1 cup of white chocolate melting wafers and stir in 1/2 teaspoon of peppermint extract and 2 tablespoons of finely crushed candy canes. 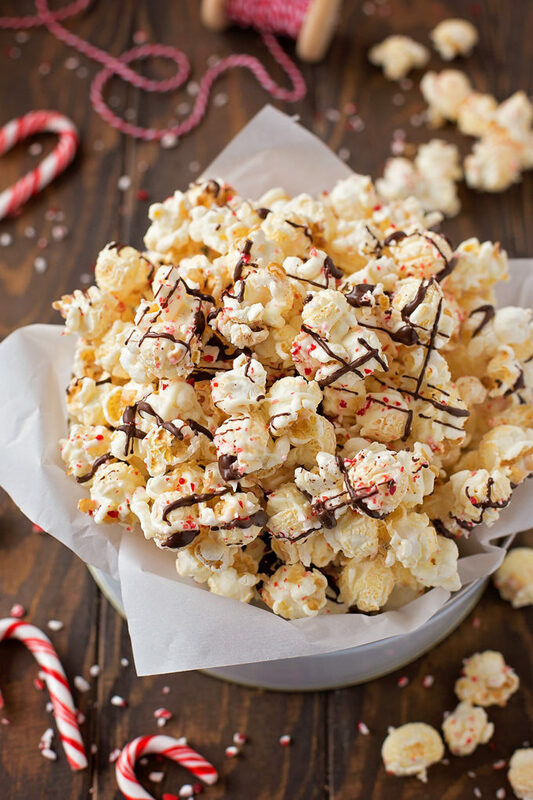 Drizzle the white chocolate over the popcorn. 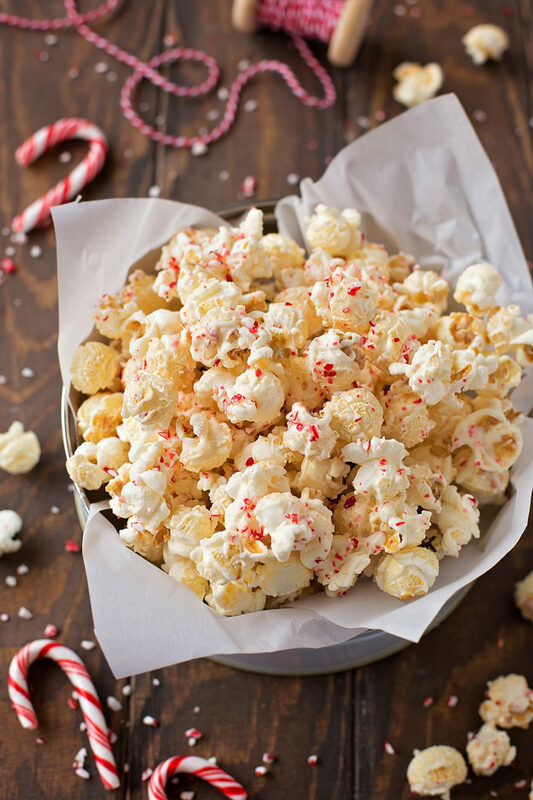 To prevent the popcorn from getting soggy, it’s best to constantly toss or stir the popcorn as you’re adding the white chocolate. Next, you’ll pour the popcorn onto a lined baking sheet. Spread it into an even layer, then sprinkle with crushed candy canes, festive sprinkles (if you want) and a few pinches of sea salt. Now you can either place it in the refrigerator to set as is, or you can drizzle dark chocolate over top. The choice is yours! After chilling for 20 minutes, it’s good to go! Break it up and serve it or package it up in cute little bags, tins or boxes. It’s enough to feed a crowd or to give to all of your neighbors, co-workers, family, and friends! This is a holiday treat that everyone will love. It’s sweet and salty with just the right amount of peppermint. Plus, it’s incredibly easy to make! Happy popping! 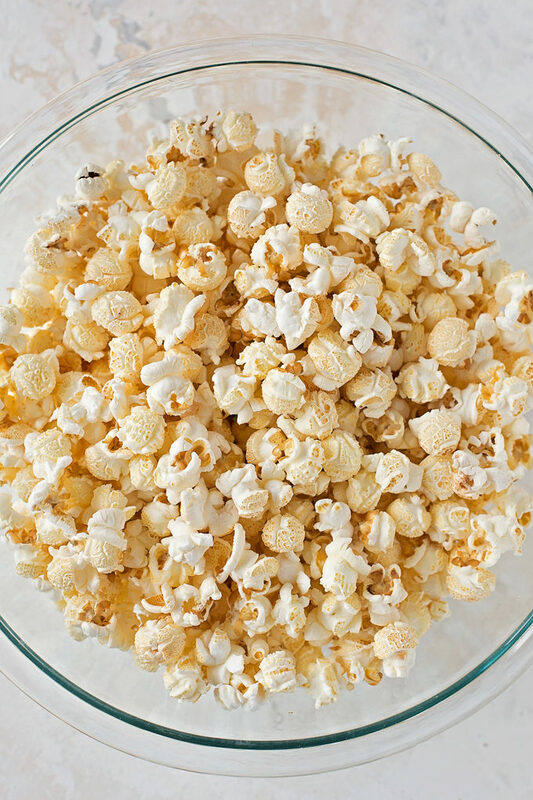 Using a popcorn maker or a large pot on the stovetop, pop kernels, set aside. Melt white chocolate melts and peppermint baking chunks over a double boiler or in the microwave. Drizzle over popcorn, stirring constantly to prevent the popcorn from becoming soggy. Line a rimmed baking sheet with parchment paper, wax paper or a silicone baking mat. 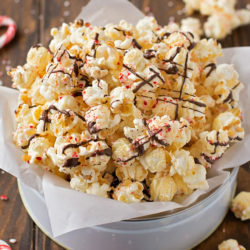 Pour popcorn over top and spread into an even layer. 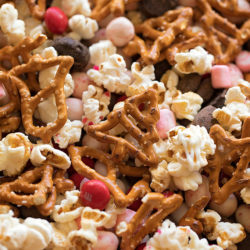 Sprinkle with candy canes, sprinkles and sea salt. Melt dark chocolate melts over a double boiler or in the microwave. Drizzle over top if desired. 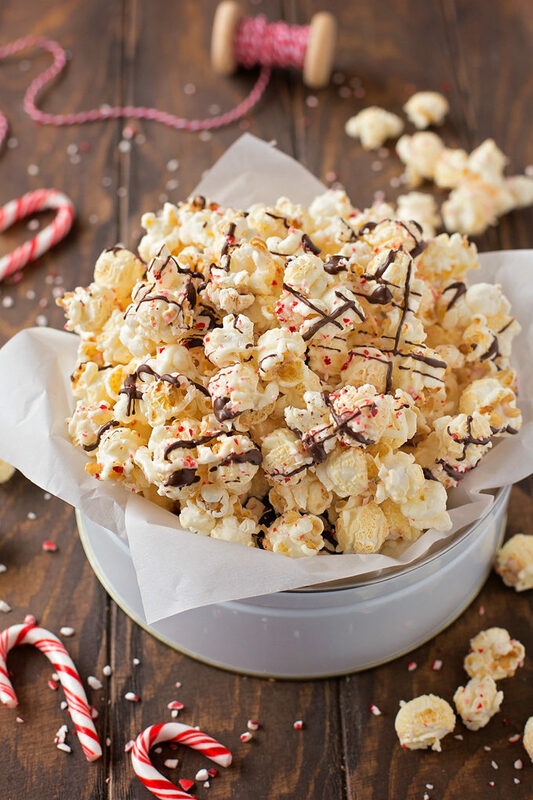 Place popcorn in the refrigerator for 20 minutes to allow chocolate to harden. Remove and break into pieces. – You can buy pre-crushed candy canes during the holidays. I use them in all of my Christmas baking/candy making. They’re all the same size and they don’t stick together as much as when you crush them at home. – I purchased my mushroom popcorn online, but I’ve seen jumbo popcorn (Popsecret?) at local grocery stores and Target. 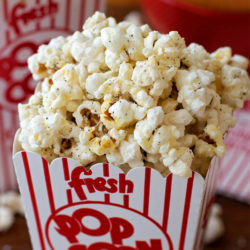 – Do not use popcorn with butter or salt. All images and text ©Life Made Simple. 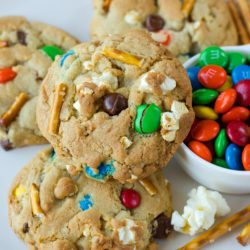 I have a serious sweet tooth and a passion for food photography. Welcome to my happy place! Copyright & Privacy Information: All content and photography is copyright Life Made Simple and Natalie Dicks, ©2010-2019, unless otherwise stated. Content may not be duplicated or republished without permission (please email me). If you would like to share a recipe, please re-write the recipe in your own words and link back to the original post. This site contains affiliate links and sponsored posts. View full privacy and disclosure policy. ©2019 Life Made Simple. Design by Purr.